Score pieces for as low as P290 at Uniqlo's Best Priced Items Sale. They've got discounts in the Men's, Women's, Boys', and Girls' section so there's a little something for everyone. 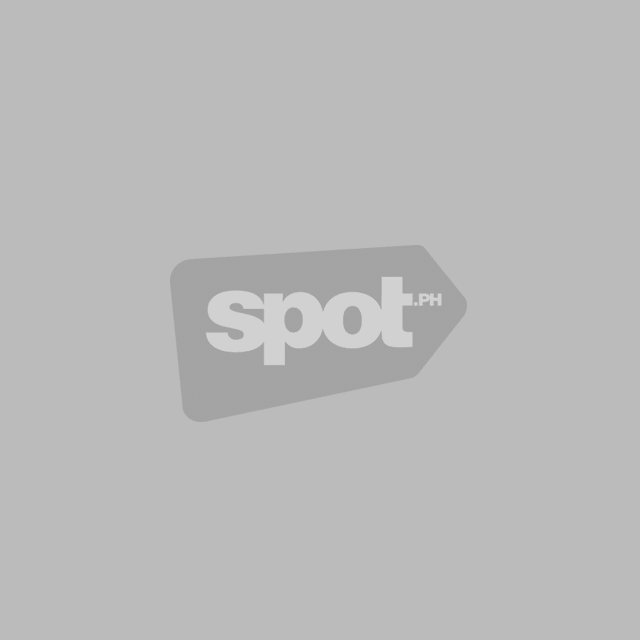 Plus, lots of items are under P1,000. Happy shopping! Get up to 70% off on your next pair of running shoes (yes, this is a sign to start on your #fitnessgoals) when you drop by The Playground Premium Outlet Store located in Nodison Centre Building on Marcos Highway in Marikina City. They've got tons of goodies from Nike up for grabs, so better hurry to get first dibs! A true stationery lover knows that you can never have too many pens—or pencils, highlighters, markers, or any art supplies, really. 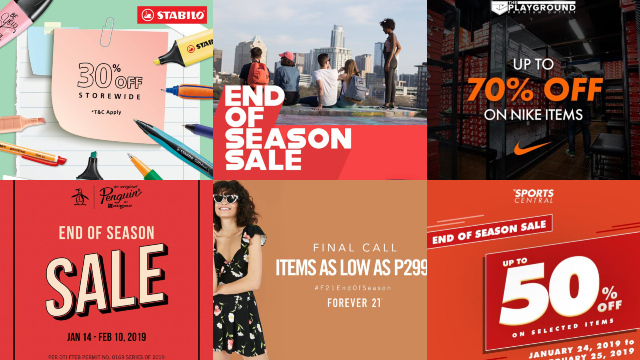 Grab some more goodies for your collection at this Stabilo sale, where you can get up to 30% off on all store items when you spend a minimum of P400. Best part? This one's online, so you won't even have to leave your house to add to your stationery collection. Hurry, you've got until January 31! Payday weekends are for revamping your wardrobe, and this sale couldn't be more timely. 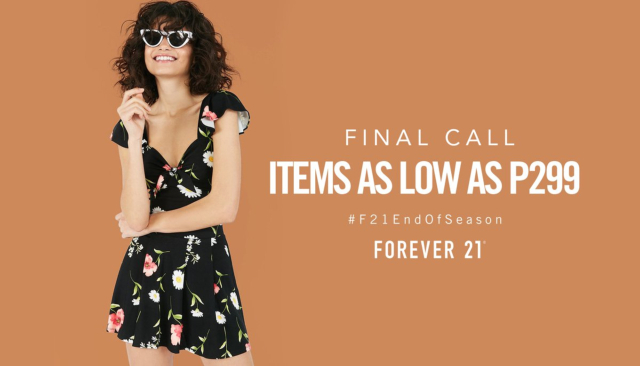 Shop clothes, shoes, bags, and accessories for as low as P299 at Forever 21's End of Season Sale happening until January 31. We suggest going ASAP to get dibs on the most stylish pieces! 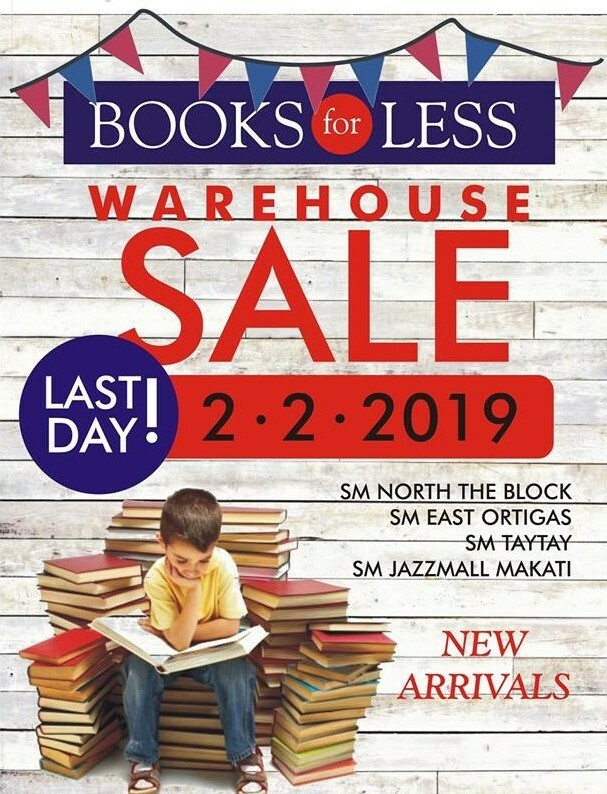 Book lovers, we've got something for you: Score new reads for as low as P35 at Books for Less' Warehouse sale. Just drop by any of their branches at SM North The Block, SM East Ortigas, SM Jazz Mall, and SM Taytay. You've got until February 2 but we know you're going to want to grab your new books, stat. Happy reading! MUJI's End of Season Sale has been extended, which means you can enjoy additional markdowns! Get up to 70% off on their minimalist organizers, office supplies, clothing, and household items. 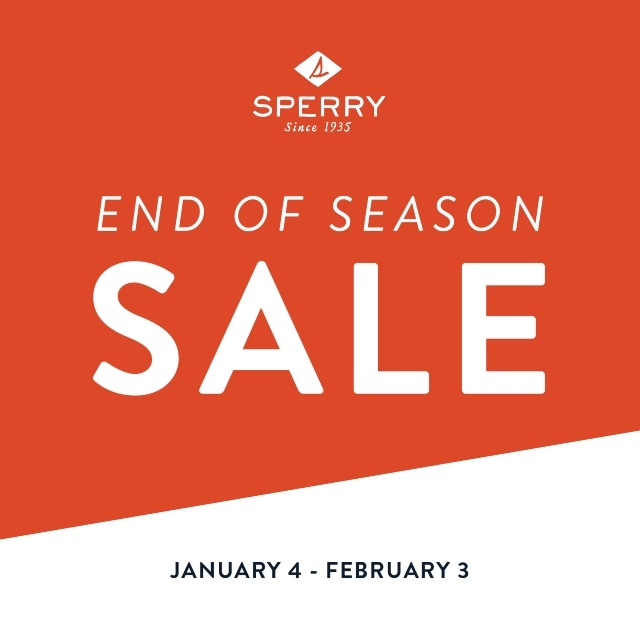 In case you missed the first round of discounts, better hurry and catch this one—you've got until February 3! Sperry shoes are known for being super comfy. They're versatile, too, as they come in classic styles. Now is the best time to shop some pairs because you can score discounts up to 50% off at their End of Season Sale until February 3—don't miss it! Get yourself a new backpack at JanSport's End of Season Sale where you can score discounts up to 30% off. Get this sweet deal at Bratpack, The Travel Club, GRIND, The SM Store, any Jansport store or even online. They've got tons of bags with cute patterns and colors to choose from—some are even under P2,000. You've got until February 4 to snag a new bag! 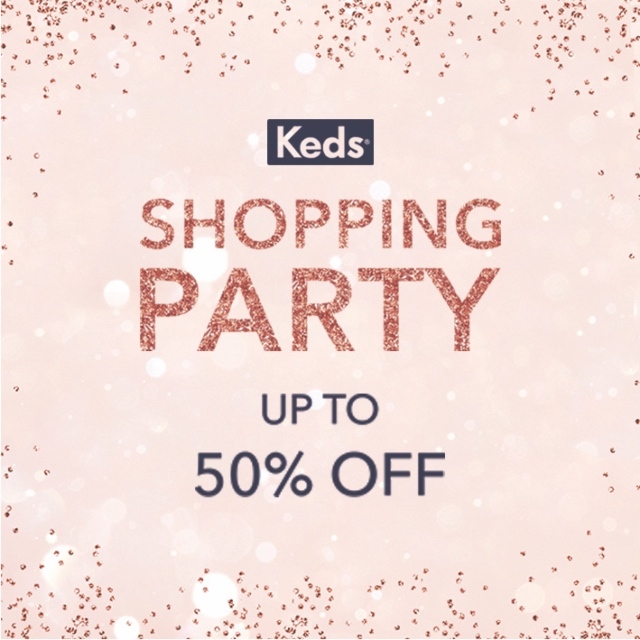 Get up to 50% off on selected styles of Keds' classic sneakers at their Shopping Party Sale—and it really does feel like a celebration, doesn't it? Just drop by any of Keds' branches nationwide or you can even shop them online. The sale ends on February 4 so don't miss your chance to own cool new kicks! Get up to 70% off on World Balance sneakers when you drop by their Warehouse Sale at the Geomax Compound in Caloocan City. You've got until February 7, so round up the squad and plan when to go! Grab some new shirts, shorts, or wallets for the guys in your life at Penguin's End of Season Sale. Their classic-but-fun designs can fit anyone's personal style so you won't have a tough time picking out a few great pieces. Just visit any Penguin branch nationwide until February 10 to score this sweet deal! 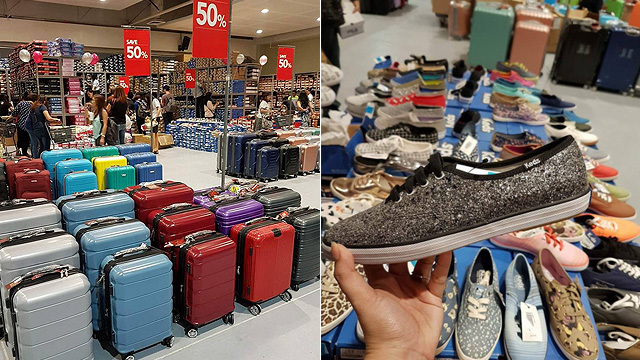 Get up to 50% off on shoes and apparel for your next workout—or just to rock some cute athleisure looks—when you drop by Sports Central's End of Season Sale. Just drop by any of their stores at SM Malls. They carry brands like Nike, Adidas, New Balance, Keds, Skechers, and more. You've got lots of time because the sale is happening until February 25! Looking for new workout clothes? You're in luck because you can get 10% off on Forever 21's cute activewear pieces when you show them any valid proof of your gym membership! Just drop by any Forever 21 branch until February 28 to avail of the promo. 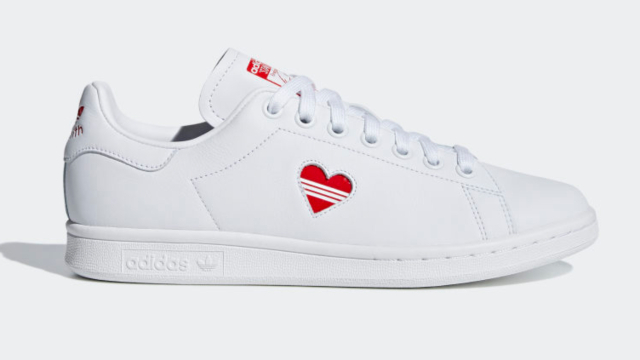 Feel like going sneaker shopping? Grab a pair from Skechers' End of Season Sale! You might even score new clothes and cool watches, too! 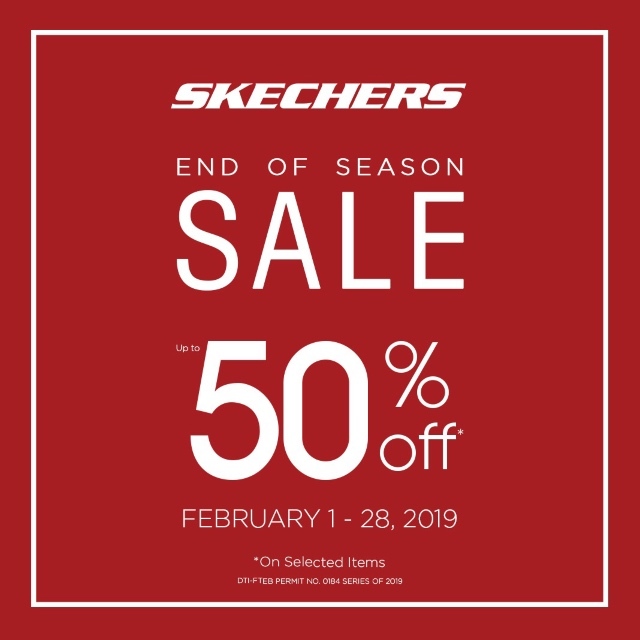 Enjoy discounts up to 50% off until February 28 when you drop by any Skechers branch nationwide.